Scores of labour activists converged on a quiet business park in Mississauga (west of Toronto) on August 22 to deliver a message to Target Stores CEO Gregg Steinhafel. The American retail giant recently bought out more than 100 former Zellers stores in a takeover deal leaving at least 12,000 jobless. The Stephen Harper Conservative federal government approved the takeover this year without ensuring that any of those workers would keep their jobs, much less retain their hard-earned benefits and seniority. Ryan’s dire warning could not be more pertinent. This predatory takeover, just like the flight of a Caterpillar diesel engine plant from London, Ontario to union-busting Indiana earlier this year, is a reminder of the increasingly precarious nature of work in the capitalist system. The United Food and Commercial Workers union is challenging the dismissal of the few unionized workers in this sector, trying to invoke ‘successor rights’ as Target takes control of the Zellers chain. But employers’ more frequent use of strike-breaking legislation and other anti-union laws are making the legal system less and less a recourse for pursuing any justice for workers. Militant talk must be matched by more militant action, including mass pickets that shut down anti-worker enterprises. Only then will workers realize their power. As reported here previously, the Liberal provincial government of Quebec is imposing a sharp rise in university and college tuition over the next seven years. This sparked massive demonstrations by students and their supporters throughout the spring and summer, some of which have attracted over 300,000 protesters. Despite its name, the law is much more about silencing and repressing protesters than enabling students to attend class. It prohibits any gatherings in school buildings and on school grounds, and within 50 meters of the outer limits of school grounds, which “could result” in denying students access to classes. It also requires all organizers of demonstrations involving 10 or more people to give advance notice to local police of the demonstration’s date, time, venue, route and duration, and allows the police to unilaterally order a change in venue and route. A violation of these provisions could result in a $1,000 to $35,000 fine for individuals, or a $25,000 to $125,000 fine for organizations. Bill 78 has been criticized by the Quebec Bar Association and the Canadian Association of University Teachers, among others. A law professor at the Université du Québec à Montréal called it the “worst law” that she has seen since the invocation of the War Measures Act in 1970, which brought Canadian troops onto the streets of Montreal. Student associations brought a legal challenge against Bill 78, on the basis that it infringes on constitutionally-protected rights such as freedom of expression. An early attempt at an interim injunction against implementing the law failed, although the case remains before the courts. Quebec has long been admired for its so-called ‘social-democratic’ character – unique in North America and exemplified by its low post-secondary tuition rates. With the Liberals now attempting to shift the province closer to the continent’s neo-liberal mainstream through its tuition hike plan, outsiders have been inspired to see the Quebecois rise en masse to defend their progressive gains — conquests of the nationalist movement in the 1960s. Socialists stand with the students and workers of Quebec and demand an immediate repeal of Law 12, and cancellation of the planned tuition hikes. We back the call of the leftist Québec Solidaire party to eliminate all university and college tuition fees. Greece has perhaps the most politicized population in Europe. 11 million people. Half of them live in Athens/Piraeus. Greece is 80% mountains, 20% agricultural. It won its independence in 1830 after 400 years of occupation by the Ottoman Empire/Turkey. Greek workers freed their country from Italian fascist and German Nazi occupation during WW2 by means of a guerilla war, led by the Communist Party. A civil war between the left and the right continued through the 1940s. In 1958, opinion polls showed that the KKE had the support of 25% of voters. This worried Washington to no end. It backed the Colonels’ military coup in 1967. The Greek military dictatorship lasted until 1974. Through the 1980s PASOK and New Democracy took turns at governing. In the late 1970s and early 1980s Greece enjoyed prosperity, fueled by tourism, shipping and a growing service sector. It has many agricultural exports as well (olive oil, cotton, fruits and vegetables). In the early 2000s, a capitalist overproduction crisis went into overdrive. More cars, appliances and homes were created than could be sold for a profit. Workers’ wages had stagnated for decades. To keep the economy from going into recession, governments around the world (USA, Canada, Japan, Europe) ran large deficits. The government deficits derived not just from spending, especially spending on the military, but resulted from reductions in taxes on profits and personal wealth. Corporate and personal credit was greatly extended. The Greek government borrowed from German banks, at high interest rates — with much encouragement from the EU. Greeks went into debt, just like Americans, Canadians, Irish and Spaniards, etc., to indulge in the consumerism that the rulers said would save the economy from recession. Another big factor for Greece was the very costly arms race with Turkey. It’s important to understand the nature of the European Union, and its various charters. The best comparison we can make is to the Canada-US Free Trade Agreement, and to NAFTA. These deals are not about sharing the wealth, sharing the fruits of development, much less about sharing the burdens of a downturn. They are about freeing Capital from constraints. Those trade agreements are mainly a charter of rights for big business. They entrench the deregulation of labour markets, the lowering of environmental standards, and the privatization of public services. They enable the most developed economies and sectors to prey upon the less developed ones. In this way, northern Europe lay siege to Europe’s southern, eastern and western rim. When the world capitalist bubble burst, Greece was highly exposed. Its corporations and its rich people were taxed very little, and they ignored the taxes they owed. Is it any wonder Greek shopkeepers and workers didn’t feel like paying taxes either? But Greek workers are not lazy or unproductive. Greek workers log more hours at work than workers in most countries. But the wealth they created was looted. Profits were invested abroad, leaving many cupboards bare. The economic crash in 2008 hit Greece very hard, especially tourism and shipping. It followed devastating forest fires and a huge Olympic debt. Still, the rich demanded their pound of flesh. Under capitalism there is only one way to restore private profits, and that is to squeeze labour. 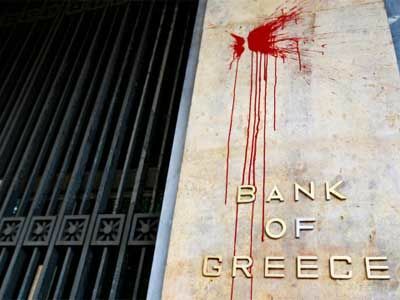 The EU Commission, the European Bank and the IMF (the ‘Troika’) demanded sharp austerity measures. Their main targets were jobs, wages, pensions, and raising government revenue via fees and tax hikes, especially through regressive taxes on consumers. In Ontario the Harmonized Sales Tax is 13%. The Greek VAT is 23%. The series of severe measures imposed a 40% cut in the living standards of workers and their families. Greece went from ‘prosperity’ to 25% unemployment. It is over 50% for young people. Everywhere businesses are closed, stores abandoned. People are losing their homes. Greece went from the lowest rate of suicide to one of the highest. In 2010, statistics show an 18% rise in the number of suicides. In 2011, Athens alone saw a 25% increase over the previous year. These worsening conditions sparked 12 general strikes, and many riots, just in the past two years. The parties most identified with austerity, most guilty of compliance with the horrendous bail-out conditions imposed by the Troika, are PASOK and New Democracy. They lost a lot of support. SYRIZA, the so-called coalition of the radical left, rose from 5% to 18%. The election in May 2012 was inconclusive. No party could form a government. The election on June 17 saw the right wing vote gravitate to ND. The left wing vote moved to SYRIZA. Syriza is not a party; it is a coalition, and not a very radical one, despite what the business media says. The dominant party in Syriza is Synaspismos. Synaspismos is a right wing split from the KKE of more than 30 years ago. And what about the so-called Democratic Left, which is now part of the ND-dominated, pro-austerity, pro-Memorandum government. It too emerged in a split from Synaspismos. Over the past year, and especially after the May election, Syriza modified its policies towards a solidly ‘pro-Euro zone’ stance. To stay in the Euro means paying the usurious debt, not reneging on it. ‘Re-negotiate the debt’ means delaying full payment, not abolition of the rip-off. Also, Syriza is staunchly electoralist. That means it sees strikes and popular rebellion as a threat to its electoral ambitions. Emphasizing electoral solutions put a damper on rebellion, and it contributed to demoralization. This is reflected in the lower voter turnout each time, most recently down to 61%.. It has another consequence, a much more terrible one. The sense of helplessness, the crisis of leadership on the left, emboldens the far right. That accounts, at least in part, for the rise of the neo-Nazi Golden Dawn party. From close to zero for decades, it rose to 7%, and it held its vote share in June. The neo-Nazis don’t just talk about crushing leftists, immigrants, gays and visible minorities; they engage in violent, sometimes deadly attacks on their targets, in the plain light of day. The urgent need to deal with the fascist threat poses a real challenge to the workers’ movement today. Unfortunately, Syriza downplays the problem, or it seeks a ‘legal’ solution (the possible outlawing of Golden Dawn). And the KKE refuses to work with anyone else on this issue, or on any issue. Fortunately, there is a coalition of revolutionary political organizations. It is called ANTARSYA. It is composed of 10 Trotskyist, ex-Stalinist and Maoist groups, including the SWP and the OKDE-Spartacus, Greek section of the Fourth International. ANTARSYA was formed in 2009. The acronym means “anti-capitalist left cooperation for the overthrow”. The actual word “antarsya” means “mutiny”. So, what is the meaning of the June election results? The election of June 17 occurred because after the elections of May 6 no parties were able to form a coalition government. The result, not unexpectedly, was a “victory” for the right wing New Democracy (ND) with 29.7% (compared to 18.9% from May 6). The left alliance SYRIZA rose from 16.8% (May 6) to 26.9%, but was again only the second strongest party. Thus, the 50 “extra” seats in parliament, decisive for the formation of a government, were captured by the now leading pro-memorandum-party ND. ND was forced, however, to form a coalition government with the greatly diminished and discredited ex-social democratic PASOK, the third strongest party with 12.3% (a decrease of 0. 9%). DIMAR, the right wing split from the SYN-party (the leading force in SYRIZA), is also involved in the new government. DIMAR polled 6.3% (+0.2%) and is thus the sixth strongest party. For the first time DIMAR openly takes responsibility for the memorandum policies. The “Independent Greeks,” a spin-off of ND, who reject the memorandum, achieved a fourth place finish, with 7.5% (- 3.1). The neo-Nazi gang of Chrysi Avgi (“Golden Dawn”) is now in fifth place with 6.9% (- 0.1). The stabilization of the neo-Nazis is even more remarkable since their terrorist character was openly revealed in the weeks after the May 6 vote, with brazen attacks on immigrants and leftist politicians using knives and clubs – in full public view. Nobody can say any longer that the voters do not know what they were voting for. The permanent presence of the Nazis in the Greek Parliament – along with almost daily terrorist attacks on the streets of Athens and elsewhere – is the most striking result of the elections. The KKE received just 4.5%. It lost 4% compared to May. All parties below the 3% threshold on May 6 had big losses, including LAOS with 1.6% (- 1.3), “Dimourgia Xana” with 1.6% (- 0.6), the “Green Ecologists” with 0.9% (- 2.0) and ANTARSYA with 0.33% (- 0.9). The valid votes cast represented 61.5% of the electorate (- 1.2), again significantly lower than ever before. A closer look at the election result shows that the shift between “right” and “left”, compared to May 6, is not very big. The right-wing parties (from ND to GD) together polled 47.3%. The percentage of PASOK as a “new” right-wing party should be added to this. The left received altogether 39% taking into account also DIMAR and the Greens. The pro-memoranda-parties, ND, PASOK, and now DIMAR too, scored together 48.3%. They have a majority in Parliament. In accordance with the rules of bourgeois parliamentarism this might be interpreted as providing a “democratic mandate” for the continuation of the memorandum policies. Nevertheless, this “mandate” is, even in a formal sense, quite weak. ND’s ”success” must be partially attributed to the unprecedented propaganda campaign of the memorandum parties and the mass media in Greece and other European countries, according to which an electoral victory of the left would have meant Greece’s immediate exit from the euro, the absolute economic ruin of the country, the termination of all payments, etc. In addition, ND was able to attract most of the traditional right electorate that was very fragmented on May 6. Nonetheless, the election results of ND are generally weak, reflecting a historic downward trend that will continue now with ND’s role as the leading government party. On the left, the SYRIZA alliance could establish itself as the leading force primarily because had it come in first. This offered the possibility of a “left government”. The slogan “Elections now!” issued by the two leading reformist parties, i.e. KKE and SYRIZA, especially since the great general strike of October 2011, represents a strategic failure. It was not possible to stop the memoranda policies by parliamentary means. The relative strengthening of the Left as a whole in the two elections was the result of the large mobilizations of social resistance from May 2010, with its high points of June and October 2011, as well as on February 12. But the resistance was not strong enough to bring down the memoranda policies. Thus it is not accidental that the strength or weakness of the entire left in the elections reflects the real balance of power between the main classes in Greek society. In this respect the election results are the political expression of the temporary defeat of the resistance movement. The weakening of KKE in the elections can be partly explained by its resolute “isolation tactics” along with its strict refusal to cooperate with other left forces at any level. This is connected to a complete lack of any plan designed to end the prevailing policy, whether it be by strengthening the resistance movement, or by reliance on the (ultimately illusory) parliamentary path. The SYRIZA leadership has taken clear steps to carve out space as a “left” alliance for the management of the existing political and social system­i.e. Greek capitalism­at the government level, particularly after May 6. Still, it is obvious that the ruling classes of Greece and the EU prefer to get along without the services of SYRIZA in this regard. The SYRIZA leadership has fully accepted the logic of the Troika credits and their principal legitimacy and thus the debt repayments. At the same time SYRIZA accepts the wage and pension cuts and the general lowering of living standards imposed by the first memorandum, as well as the prospect of remaining in the euro-zone. These things were seen as the primary objective of government policy, thus accepting the “legitimacy” of the extortionate dilemma posed by the ruling classes. In this way, the main demand of last year’s movement “We owe nothing, we do not pay, we do not sell!” was completely diluted, or turned upside down. On the central issue of immigration, the SYRIZA leadership succumbed in large part to the prevailing policies and declared immigrants to be a “problem.” The SYRIZA leadership has not said a word about how the social resistance can be put back on its feet or how the deadly threat posed by the neo-Nazi hordes can be stopped. For ANTARSYA the election results of June 17 were certainly disappointing, but not surprising. It needs more coherence at the central level, more cooperation and less ego among its various organizations. It needs greater strength in its local committees, an ability to take a stand and respond clearly and convincingly to the central issues. ANTARSYA is now analyzing its setback. It will draw the appropriate conclusions. Only in this way will it be possible for ANTARSYA to develop as one of the main engines of the resistance movement and as the anti-capitalist and revolutionary pole of the left. There is no shortage of starting points for joint actions by the entire left in the spirit of a united front policy. The programmatic perspective for the battles ahead has, to a large degree, been correctly outlined by ANTARSYA. The class struggles will undoubtedly sharpen in the coming months. It is for this that the social resistance must prepare. Greece remains at the epicenter of the crisis of capitalism. It is the target of the most vicious attack by capital. The youth and the workers of Greece have answered this offensive with a massive mobilization that has discredited the traditional political Greek regime of PASOK and ND. The ruling class no longer controls the situation, but the working class is not yet able to seize power and overthrow capitalism. Spain and Italy are the next targets of the Troïka (then maybe France). The outcome of the ongoing struggle in Greece is decisive for all anticapitalists and revolutionaries throughout Europe, and around the world. So, what is to be done? Our Greek comrades make the following 4 points: 1. A government that would abolish the memoranda would be a positive step for the workers and their struggles. But how can you abolish the memoranda without abolishing the debt? How can you finance the necessary and urgent measures without socializing the banks? In short: how can you improve the situation of the Greek masses without confronting the capitalist minority’s power over the economy and society? In response to any government that would challenge the program dictated by Capital, clearly the big banks and the EU would immediately halt all sources of financing and all possibility of loans. They wouldn’t hesitate to throw Greece out of the EU. In such a situation, one would be forced either to bow down and return to the same old disastrous policies, or confront the bankers and capitalist powers, by taking back what they stole and challenging their control over the economy. In terms of measures that need to be taken, a program of confrontation with the Capital is necessary. A program of transitional demands such as a general increase of wages, a radical decrease of working time, the cancellation of the debt, the socialization of the banks and of the key sectors of economy under workers’ control. Such a program implies a clash not only with the Greek ruling class but also with the European bourgeoisie and its institutions. 2- The only way to put in practice a program of struggle against the crisis and a break with capitalism is a general mobilization of workers and the popular masses. It is not just a slogan or an abstract idea. The pressure of Capital is huge. The 24 or 48 hour strikes, the previous sectoral strikes… have resulted in a grave political crisis for the Greek bourgeoisie, but have not been sufficient to stop the capitalist offensive. It is therefore necessary to reinforce the partial struggles, to strive to extend them, and to systematize the elements of self-organization that already exist and, under certain circumstances, that can be the core of a future dual power. It is through a generalization of the struggles, and by federating the organs of self-organization, that a worker’s power will rise and confront the bourgeoisie. It is with the threat of an extension of their struggle to the rest of Europe that the Greek workers will be able to protect themselves from EU’s pressure. The youth and the working class of Greece have the key to current issues in their hands, they are the ones to be counted on to find a solution. Such a workers’ government would have to implement a program against the crisis, would have to be ready to apply key transitional measures, such as the socialization of banks and strategic sectors of the economy. A government resting on a general mobilization of the workers and based on their self-organization. A government that would unite all forces ready to defend the masses’ demands. Revolutionaries would participate in such a government with other forces on the basis of a confrontational program and of a high degree of workers’ and youth’s mobilization. Because such a government would open the possibility for the workers to seize power themselves. Under the present circumstances, and given the character of Syriza, a Syriza-government would be a left social democratic parliamentary combination. That is not the same as a workers’ government. Therefore a revolutionary political instrument to prepare this confrontation and to popularize the program is needed. 4- If a government led by Syriza took measures favorable to the workers, such as putting into question the memoranda, it is obvious that revolutionaries would support those measures. However, such a critical and conditional support for a Syriza government does not in any way imply that the anticapitalist and revolutionary left (mainly represented by Antarsya) should renounce its political and organizational independence. Needed is an independent party, whose center of gravity would be the class struggles, not the parliament and the bourgeois institutions. A party able to embody a visible political pole, not only in elections, but in the mass struggles, is necessary to defend the only perspective for Greek workers to avoid the catastrophe. Needed is a party both able to have a united front policy towards the other forces in the workers’ movement, and able to defend its own political perspective: the break with capitalism and the seizure of power by the workers. We assess that, under the present situation, the creation of such a party depends mainly on the developments within and around Antarsya, despite its limitations. This project may also include common actions with anticapitalist minorities in Syriza and with small revolutionary organizations that work independently. while watching a Euro cup match on TV at a pub in the Exarcheia district of central Athens, we saw fans of the Greek soccer team drive through the area sporting the flag of Greece. They were suddenly besieged by dozens of anarchists who tore the flag from them. Police patrol only the outskirts of the area. 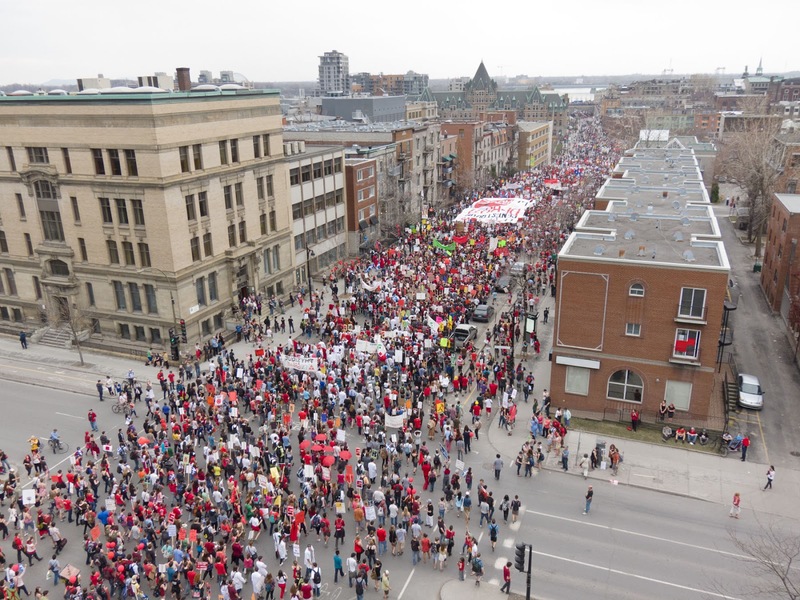 Le 19 mai 2012, le gouvernement libéral du Québec a adopté une loi draconienne, la loi 78, dans le but de mater la grève massive des étudiants qui secoue la société québécoise depuis plus de quatre mois. La bien nommée Loi Matraque s’en prend aux droits de réunion, de manifestation et de liberté d’expression. La loi suspend la session académique de tous les collèges et universités affectés par la grève, interdit les lignes de piquetage aux abords des institutions d’enseignement, force les professeurs (qui sont majoritairement favorables à la grève) à se présenter au travail lorsque les cours reprendront en août, permet de prélever des retenues à même les cotisations de toute association d’étudiants jugée responsable d’avoir perturbé les cours, et rend illégale toute manifestation qui n’est pas préalablement approuvée par la police. Les associations d’étudiants réputées enfreindre les clauses de la loi seront punies au moyen d’amendes pouvant atteindre cent-vingt-cinq mille dollars par jour. La police a choisi d’user de ses nouveaux pouvoirs de manière sélective et guette le moment d’agir. N’empêche, plus de deux mille arrestations ont eu lieu depuis le début du conflit (quatre fois le nombre d’arrestations effectuées pendant l’application de la Loi sur les mesures de guerre en octobre 1970). Plusieurs étudiants ont été blessés gravement par les armes policières. À n’en point douer, les manifestations monstres des 22 mars, 22 avril et 22 mai se sont déroulées pratiquement sans incident puisque tant la police que les provocateurs se sont inclinés devant la loi des grands nombres. Les étudiants se sont attiré l’admiration générale pour leur courage, leur ténacité et leur créativité. En dépit de cela, le gouvernement reste inflexible. Pourquoi ? Bien évidemment, quelques réactions indésirables n’ont pu être évitées. Trente années de « rétro-libéralisme » ont eu un impact sur la conscience populaire. D’aucuns croient que les étudiants devraient « payer leur écot », tant l’austérité semble inévitable. Ces gens veulent que l’ordre se rétablisse. Les médias dominants font bien évidemment la promotion de cette vue et tentent de dénigrer les étudiants en magnifiant chaque incident violent (en évitant soigneusement d’en dire autant de la violence policière). À noter à ce chapitre l’écart de ton entre les médias francophones et anglophones. Ceux dont la plume est la mieux trempée dans du vitriol pour décrire les étudiants sont les médias de droite de l’extérieur du Québec ; tandis qu’à l’intérieur du Québec, les attitudes sont en corrélation très nette selon la langue maternelle. Cela ne suffit cependant pas pour expliquer la posture rigide du gouvernement qui consiste à ne pas faire de concession. Le parti libéral du Québec est dans une vaste mesure le parti de la classe des capitalistes au Québec, et Charest leur lieutenant. La bourgeoisie québécoise trépigne d’impatience à l’idée d’imposer l’austérité, dans une vaine tentative pour améliorer la position concurrentielle du capital québécois. Les années passées au pouvoir pour les libéraux ont été consacrées à mater l’héritage de la soi-disant « Révolution tranquille », savoir, les gains que les soulèvements ouvriers des années soixante et soixante-dix ont entraînés pour les ouvriers québécois et pour la nation québécoise dans son ensemble. En fait, le gouvernement a été en mesure d’arracher des concessions majeures aux syndicats du secteur public québécois en 2005 et 2010. Il importe de noter qu’en 2005, les libéraux se sont vus forcés de battre en retraite devant la mobilisation des étudiants au moment de leur première tentative de faire avaler à ceux-ci une hausse des droits de scolarité. Aujourd’hui, le gouvernement Charest est déterminé à parvenir à ses fins. Pour l’emporter contre un adversaire aussi tenace, les étudiants auraient besoin du soutien du mouvement ouvrier, pas seulement des ressources dont les syndicats ont fait don, mais la préparation et l’organisation d’au moins une grève générale d’une journée. Les chefs syndicaux ont refusé d’envisager cette possibilité. Las ! bien que l’idée d’une « grève sociale » soit dans l’air, aucune force politique de taille ne semble disposée à présenter une telle demande aux syndicats et à se battre pour en voir la matérialisation. 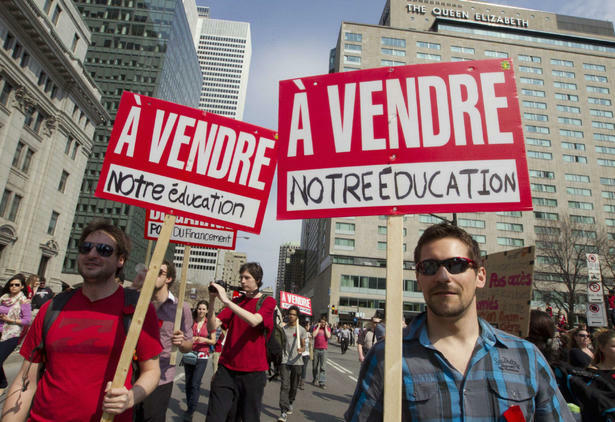 Peu importe le résultat de la grève, les jeunes étudiants québécois ont ébranlé le statu quo néolibéral jusque dans son socle. Le combat pour le gel des droits de scolarité, lié au but d’atteindre la gratuité de l’éducation supérieure, a touché un point sensible. Deux visions différentes de la société nous sont présentées : d’un côté, la marchandisation implacable des ressources tant naturelles qu’humaines au bénéfice de quelques-uns et l’amoindrissement du niveau de vie du plus grand nombre en dégradant l’environnement, de l’autre, le contrôle démocratique collectif de la chose publique de manière à garantir une vie décente pour chacun et la promotion de la responsabilité de gérance de la planète, plutôt que sa ruine.